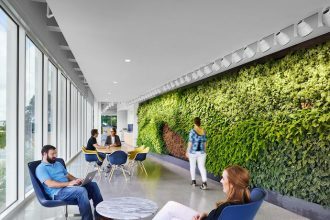 When software company Enthought, Inc. enlisted interior architecture firm lauckgroup to remodel their Austin office, they envisioned an environment that reflected the company’s commitment to efficiency, imagination and collaboration. In less than two years, marketing software company ActiveCampaign quadrupled its staff, becoming a buzzworthy name in the tech industry and one of the fastest growing companies in Chicago. CEO & Founder Jason VandeBoom envisioned a new office that was truly employee-centric. The idea that our surroundings affect our mood, productivity, and creativity was taken literally by the designers at Arkiplan International when they designed their office in a way that keeps employees’ creativity, energy, and spirit scales high. SCB worked closely with Capital One’s workplace solutions team to transform its new downtown Chicago space into a revitalized, dynamic office. Earlier this year, SAA Architects and Interior Designers fashioned a new, collaborative space for its Los Angeles-based client Stun. Evolution Design creates an innovative space for VodafoneZiggo’s call center, which inspires collaboration and a sense of belonging among employees. With an aim to encourage cross-functionality and collaboration among teams, design firm Sasaki executed an open concept space for SharkNinja, bringing together multiple offices and hundreds of employees for the first time. NELSON created an open, collaborative space for nonprofit corporation ECMC, which decided to make the move from the suburbs to downtown Minneapolis. There’s a burgeoning crop of niche co-working spaces that have unique points of view on what shared workspace is all about. Check out these profiles of three companies with unique perspective on how co-working is evolving. Security software company Trend Micro enlisted lauckgroup to artfully design their new Austin office as an innovative and open space that prioritizes the company’s emphasis on employee collaboration and interaction. Paddy Power Betfair tasked Morphoza with the challenge of designing a better working environment, while also solving functionality issues, improving productivity, attracting new staff and retaining and engaging current staff.